Today I thought I'd share a few of the common sense things to remember about Christmas Stockings. Sometimes it is the simplest things that we forget to do that cause the most frustration. Most things in life are learned by trial and error so guess how I learned these things. LOL May your path be made easier by learning what NOT TO DO. If Santa puts chocolate in your family's Christmas Stockings remember to take them down before the fire in the fireplace gets to hot. After the Christmas Stockings come down make sure the pets don't eat the chocolate or other treats they contain. Don't expect the younger children to understand they can only have the goodies that are in their stockings. In their minds unattended treats are to be consumed on site. 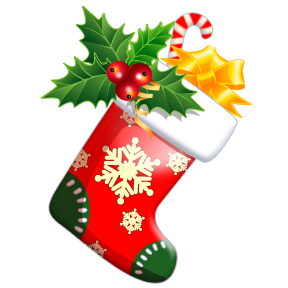 If the older children hide their Christmas Stockings from their siblings try to remember to retrieve them when putting Christmas away or they may go missing for a year or so. Felt and Plush Christmas Stockings probably won't survive the wash that is needed to remove melted candy. Neither does the glitter glue name. Santa needs to remember where the Christmas Stocking Stuffers were hidden before spending 4 hours assembling toys. If you think you can replace the old ratty treasured Christmas Stockings with new ones without any complaints you are naive. Some children think that they should get custody of their Christmas Stockings when they move out. This is something to be decided before then. If Santa really likes to load up your Christmas Stockings make sure the hanging loop is sturdy enough to carry the weight. This is really important if there are breakables inside. One inch wide ribbon works very well and can be very decorative. What Christmas Stocking Basics have you learned over the years? Please add them in the comments so we can all learn what NOT TO DO. I can definitely relate to #6!!!!!! What a fun list Pat! Thanks for sharing it. I lost it when I got to 8! I was planning on asking my mom if I could have my childhood stocking this year...maybe I should rethink that! This is so funny! My kids have Santa sacks rather than stockings. Every year Santa has to check whose sack is whose, because they are unnamed. Santa always thinks she'll remember from the design on the front, but never can!